Yeah, yeah, yeah you wrote some stuff, let me in NOW. If you want to see more sample lessons like this you're going to need a password for module three. All you need is base 10 blocks you don't have to have Mortensen Math base 10 blocks. The point of this website is to teach you how to use your base 10 blocks to best effect, giving your children of fun multi sensory math experience, no matter what kind of base 10 manipulatives you have. Once you BUY a password, click enter and over 10 hours of video await you! 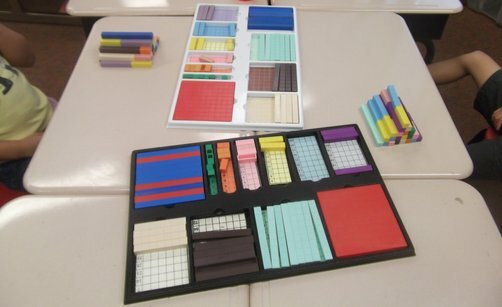 These Sample Lessons are part of module three, they show by example kids learning math with base ten blocks. The vids you find here are for the most part exclusive to this page at The House Of Math. Your search engine will not bring them back for you even if you know the name of the video. Ten and a half Hours is a lot of time but it goes by quick. None of them are more than an hour long and some of them are only 15 or 20 minutes. All of them show actual (very) unrehearsed lessons with real live students using base ten blocks. You can learn right along with them or observe how to teach a lesson yourself. Teachers and trainers find these videos invaluable because it's not just theory but theory in practice. Module two is training... You see how and why to present lessons but you don't actually get to see how it goes in "reality" or real life. You will see "mind blowing" videos where little kids to do algebra that scares teenagers... They learn multiplication and addition by factoring polynomial's. These videos show you how it's done. Best of all: it's fun. Here is a longer overview with a few seconds from a couple of the videos you will find on the Sample Lessons page: samples of the sample lessons. I have been told numerous times that this one page is worth the price of an entire module. In one lesson we go from learning addends to square roots...in another a little girl is happily simplifying polynomial fractions! Manipulatives make it EZ!. Use your module three password. Here are a bunch of FREE VIDEOS you might want to watch if you haven't already...especially this overview. I know people who took almost a year (or so they tell me) to get to the point where they were ready to buy a password. That's how much there is for free. Others want one within a week of discovering this site because they want to know about how to present specific lessons.